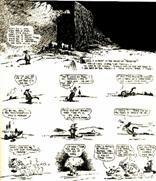 He produced hundreds of Krazy Kat comic strips over a period of 30 years, but left very little else behind about what his artistic motivations were, or how he wanted his work to be received. Quoted in M. Thomas Inge�s Comics as Culture. From the director Frank Capra�s The Name Above the Title: An Autobiography. From Herriman�s review (writing as Krazy Kat) of �The Gold Rush� in the October 1925 issue of Movie Classics Magazine. ��Once when a youth, I aspired to become a baker, a kneader of dough, to mould bread and fashion a doughnut or stencil a cookie�I slit a 200 pound sack of flour over a four foot five inch baker - we barely got him out alive, when we did, looking like a �pose plastique,� he took away the last remnant of ambition out of me. Then I became a cartoonist � as a sort of revenge on the world.� We�re doing our stuff for Mr. W. R. Hearst, but don�t let him know anything about it.� Oy, if he should know!�We love the Desert � the dry�old Desert, and that�s where you will find us � when the last drop of ink is out of our bottle and the pen snaps. 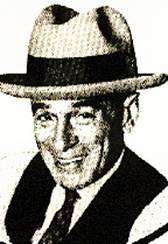 From the April 1926 issue of Ziff�s magazine.